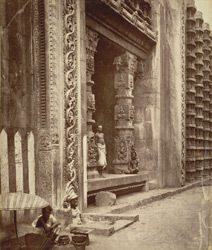 Photograph of the unfinished Raya Gopuram in the Minakshi Sundareshvara Temple of Madurai, taken by Nicholas and Company in the 1870s. This great temple complex (dating mostly from the 17th century in its current form), dedicated to an ancient local goddess, is one of the chief pilgrimage sites of South India. It is enclosed within a rectangular precinct which covers 6 hectares and has 11 huge gopurams or towers, the biggest of which mark four entrances from the four cardinal points. These towers are extremely elaborate and completely covered with figures of divinities, celestial beings, monster masks and animals, all encrusted in plaster decoration painted in vivid colours. Inside the complex there are columned mandapams or assembly halls, tanks, shrines and the two main temples of Shiva and his consort Minakshi. To the east of the temple, Tirumala Nayak (ruled 1623-1659), who expanded and renovated the complex, began the construction of a new, imposing gopuram which was never completed. The doorjambs are elaborately carved with scrollwork.